MARAC attendees, here’s a chance to see the ***inside*** of private homes within the Annapolis Historic District and support architectural preservation while taking a tour. Annapolis by Candlelight tour is an annual fundraiser for Historic Annapolis, Inc. a membership, non-profit organization founded to ensure that the legacy of Annapolis’s past would continue to enrich the city’s future. Established in 1952, Historic Annapolis is the leading nonprofit preservation and history organization in Annapolis, Maryland. Friendly volunteers at each historic property will explain the architectural features, along with stories about current and past residents of the home. This tour is popular with architecture and history buffs, home remodelers, antiques lovers, interior decorators, and those who just like to soak up the local charm of Annapolis on an autumn evening. Details are below and on the Historic Annapolis, Inc. website. A crisp autumn evening is the perfect time to walk through one of the historic neighborhoods of Annapolis. The experience is even better when the doors to some of the homes are open and you are invited inside. Each year in early November, Historic Annapolis showcases privately-owned historic houses on its popular Annapolis by Candlelight tour. Visitors see how 21st-century Annapolitans care for and live in buildings built in the 20th, 19th, or 18th century. Each house is a reminder of the rich architectural and cultural heritage of Maryland’s capital city and illustrates the practical and aesthetic benefits of effective historic preservation. The MARAC Nominations and Elections Committee want to thank the membership who participated in the recent special election to fill a vacancy on the Finding Aids Award Committee. Six candidates competed for one open position, with a term that ends in Summer 2017. A total of 316 votes were recorded and Michele Combs from the Special Collections Research Center at Syracuse University was the winner of the election. Many thanks to the candidates who ran in the election and for all of the members who voted! Thanks also go to Don Sailer and the MARAC Web Team as well as to Jim Gerencser, MARAC Administrator, for their assistance in holding this election. Please contact a member of the Nominations and Elections Committee if you are interested in running or if you would like to nominate a colleague. Please direct questions to Alex H. Poole (ahp56@drexel.edu). A special exhibit will be available at the St. John’s College, Annapolis campus located near the conference hotel’s location in the city’s Historic District. Shakespeare will make a special appearance at St. John’s College, in the form of a national traveling exhibition, First Folio! The Book that Gave Us Shakespeare, on tour from the Folger Shakespeare Library. St. John’s College, Annapolis was named Maryland’s only site to host an original 1623 First Folio. The Folger Shakespeare Library, in partnership with the Cincinnati Museum Center and the American Library Association, is touring a First Folio throughout 2016 to all 50 states, DC, and Puerto Rico. This first-ever national tour of one of the world’s most influential books celebrates 400 years of Shakespeare and his legacy. 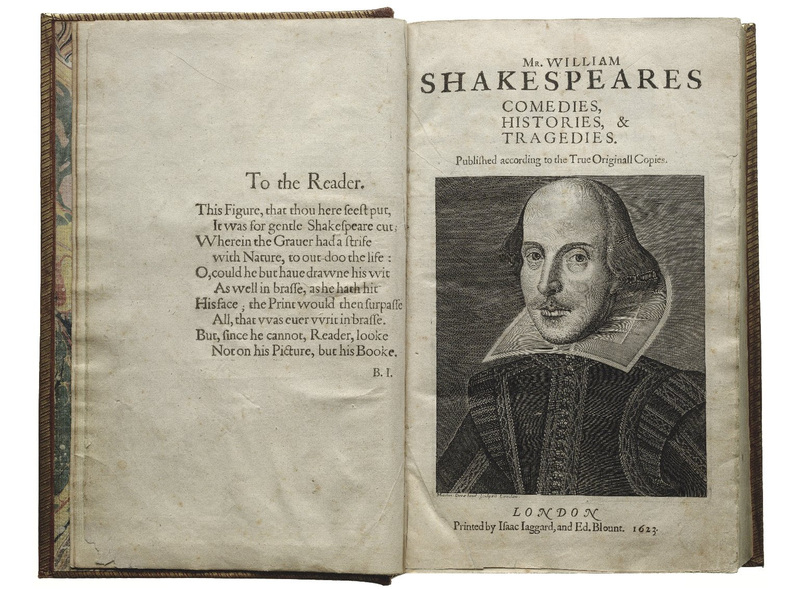 The First Folio includes 36 Shakespeare plays, 18 of which had never been printed before. Without the First Folio, all of those plays—including Macbeth, Julius Caesar, Twelfth Night, The Tempest, As You Like It, and more—might have been lost forever. Compiled by two of his friends and colleagues, the First Folio was published seven years after Shakespeare’s death in 1616. Saturday, November 5, 6:00 p.m. – An opening program “A Celebration of Shakespeare in Performance” and reception: Online registration required—opening soon at www.sjc.edu/shakespeare. For a full listing of events visit: www.sjc.edu/shakespeare. First Folio! The Book that Gave Us Shakespeare is made possible in part by a major grant from the National Endowment for the Humanities and by the support of Google.org, The Lord Browne of Madingley, Vinton and Sigrid Cerf, British Council, Stuart and Mimi Rose, Albert and Shirley Small, and other generous donors. Greetings from Annapolis LAC! We are thrilled to welcome you to Annapolis in 2016, and are equally happy to share all the dining options available to you in our beautiful town. The following list of restaurants includes the following tags. Please see this Google Map to see all the restaurants listed and their proximity to the conference hotel. Looking forward to eating with you in Annapolis! This small space offers a cozy, jazzy atmosphere. Serves breakfast, lunch, and dinner. The bar offers an intriguing selection of beer, wine, spirits, and cocktails. Delectable desserts, baked goods, and a full array of coffee confections–made with locally roasted, fresh coffee beans–are sure to please every palate. Specializing in breakfast, coffees, lattes, mochas, and teas, and sandwiches, this is a delightful find off the beaten path. Award winning Chef Jean Louis Evennou offers a kitchen dedicated to locally sourced, sustainable ingredients, often obtained that day from local farmers and producers. Modern Thai. Beware limited seating, recommend you call before dropping in on a busy evening. Authentic Irish pub and restaurant located steps away from the Maryland State House and Gate 3 of the U.S. Naval Academy. There is only one vegetarian option, but it’s delicious! (Please note that LAC happens to know that Galway already has a lot of reservations for MARAC weekend, we suggest you call ahead). Highly recommended by locals for outstanding sushi, sashimi, and more with a traditional vibe. The waiters politely greet customers in Japanese and the chefs serve fresh specials. Lots of seating, including a small patio outside. Centrally located on Main Street, Downtown. Italian cuisine by Chef/Owner Arturo Ottaviano. Food is sourced locally. Seasonal menu. A quiet, upscale restaurant with art deco flair. Perfect for foodies and people who love coastal Italian cooking. Make reservations before you go. American fare, featured on the Food Network and a favorite local watering hole for the community of Eastport. Worth going over the bridge for a super casual meal and a look at the fishing side of Annapolis. There is a decent veggie burger! A bit expensive but with a lively atmosphere that centers around the community of Eastport. Known for its interior decor this is as close to the yacht life as you can get. BREAKFAST ALL DAY!! American/Southern fare. Plus–lunch, supper, & drinks. A small plates/tapas style restaurant featuring inventive farm-to-table dishes and hand-crafted cocktails. Open for dinner only and reservations are strongly suggested. Serving breakfast, brunch & lunch, Miss Shirley’s offers cuisine rooted in Southern fundamentals and the abundance of fresh ingredients from the Chesapeake Bay region of Maryland. Specialities include decadent pancakes–a must menu item!! Wine bar serving sophisticated yet casual fare. The oldest tavern in Annapolis, and one of the oldest in the United States. Reynolds Tavern serves a full lunch menu, English afternoon tea, and dinner. In the spring, summer and early fall, we offer casual, alfresco dining in our courtyard. The cellar pub in the Tavern’s original kitchen gives you a flavor of the Tavern’s rich history. Even the truest Annapolitan will cross the bridge for this Eastport bakery, the undisputed best bakery in town! Try their almond croissants for a small piece of Paris on the Severn. No reservations–first come first served. Enjoy a glass of wine or beer as you wait for a table. Winecafé is built on family history and passion for food, wine, and beer. American fare with many ingredients sourced from local, organic providers. Influences and roots include Mediterranean, Californian, and New England cuisines. Metropolitan Kitchen & Lounge is an award winning restaurant and live music venue offering a farm to table menu for diners and an array of unique cocktails. A modern industrial take on a Prohibition-era speakeasy. The back alley garage where someone today would sneak a bourbon, beer or gourmet comfort food. Fado Irish Pub is the top Irish Pub in Annapolis. The drinks are exceptional and the food is always fresh. The three level pub includes a rooftop patio. Carpaccio offers more than just a menu of authentic Italian specialties, it has a fountain view patio and comfortably enjoy it in. Luna Blu is an intimate Italian Restaurant located in the historic district of downtown Annapolis. Located on the new “hot spot” addition of West Street it has murals & archways that lend a homey vibe at this trattoria specializing in Southern Italian cooking. An Annapolis Landmark since 1989! Rams Head is family owned and operated. Formally called “The Crown and Dial” and “Sign of the Green Tree” in the late 1700’s, this historic location was purchased by the Muehlhauser family in 1989. Originally seating only 30 customers in the original pub, it has expanded over the course of 20 years to the bustling location that it is today. Middleton Tavern was host to a galaxy of the nation’s most revered leaders during the period following the American Revolution. George Washington, Thomas Jefferson and Benjamin Franklin were numbered among its prominent patrons. If you like oysters, this is the place to get them! Congratulations to our Fall 2016 Scholarship Winners! The MARAC Scholarship Committee is pleased to announce the recipients of our scholarships to support attendance at the Fall 2016 meeting in Annapolis, Maryland. The Marsha Trimble Award ($400 towards conference registration and travel) is being presented to Jessica Whitmore. Jessica is currently pursuing her MS in Information and Library Science with a concentration in Local and Archives Studies at Clarion University of Pennsylvania. She works at Mount St. Mary’s University in Emmitsburg, Maryland. Shannon McDonald is the recipient of our $250 award for conference registration and travel. Shannon earned her Master of Arts in Archives and Public History with a concentration in Archives from New York University in 2015. She currently works for History Associates, Incorporated in Rockville, Maryland. The Karen A. Stuart Local History Collection Workshop and Attendance Award is being presented to Sarah Hedlund. Sarah is pursuing her Masters of Library and Information Science with a concentration in archives and digital curation at University of Maryland. She currently works at the Montgomery County Historical Society in Rockville, Maryland. Congratulations to all of our scholarship winners!